Discussion in 'Apple iPad News' started by iDan, Mar 5, 2010. CUPERTINO, Californiaâ€”March 5, 2010â€”AppleÂ® today announced that its magical and revolutionary iPad will be available in the US on Saturday, April 3, for Wi-Fi models and in late April for Wi-Fi + 3G models. In addition, all models of iPad will be available in Australia, Canada, France, Germany, Italy, Japan, Spain, Switzerland and the UK in late April. Beginning a week from today, on March 12, US customers can pre-order both Wi-Fi and Wi-Fi + 3G models from Appleâ€™s online store (Apple) or reserve a Wi-Fi model to pick up on Saturday, April 3, at an Apple retail store. iPadâ€™s revolutionary Multi-Touchâ„¢ interface makes surfing the web an entirely new experience, dramatically more interactive and intimate than on a computer. You can read and send email on iPadâ€™s large screen and almost full-size â€œsoftâ€ keyboard or import photos from a MacÂ®, PC or digital camera, see them organized as albums, and enjoy and share them using iPadâ€™s elegant slideshows. iPad makes it easy to watch movies, TV shows and YouTube, all in HD, or flip through the pages of an ebook you downloaded from Appleâ€™s new iBookstore while listening to your music collection. 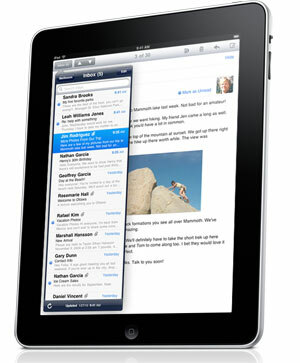 The App Store on iPad lets you wirelessly browse, buy and download new apps from the world's largest app store. iPad includes 12 new innovative apps designed especially for iPad and will run almost all of the more than 150,000 apps on the App Store, including apps already purchased for your iPhoneÂ® or iPod touchÂ®. Developers are already creating exciting new apps designed for iPad that take advantage of its Multi-Touch interface, large screen and high-quality graphics. The new iBooks app for iPad includes Appleâ€™s new iBookstore, the best way to browse, buy and read books on a mobile product. The iBookstore will feature books from the New York Times Best Seller list from both major and independent publishers, including Hachette Book Group, HarperCollins Publishers, Macmillan Publishers, Penguin Group and Simon & Schuster. The iTunesÂ® Store gives iPad users access to the worldâ€™s most popular online music, TV and movie store with a catalog of over 12 million songs, over 55,000 TV episodes and over 8,500 films including over 2,500 in stunning high definition. All the apps and content you download on iPad from the App Store, iTunes Store and iBookstore will be automatically synced to your iTunes library the next time you connect with your computer. iPad will be available in Wi-Fi models on April 3 in the US for a suggested retail price of $499 for 16GB, $599 for 32GB, $699 for 64GB. The Wi-Fi + 3G models will be available in late April for a suggested retail price of $629 for 16GB, $729 for 32GB and $829 for 64GB. iPad will be sold in the US through the Apple StoreÂ® (Apple), Appleâ€™s retail stores and select Apple Authorized Resellers. The iBooks app for iPad including Appleâ€™s iBookstore will be available as a free download from the App Store in the US on April 3, with additional countries added later this year. Does the Saturday release date surprise you? Though I'm not entirely shocked that the actual release is a couple of weeks behind the rumored date, I am kind of surprised that they chose a Saturday as opposed to a Friday. That's somewhat unusual for Apple. I am pleased that you'll apparently be able to reserve a unit for pickup at your local Apple Store during the pre-order phase. I think I'll be doing exactly that! and iPod are first hand. Although I guess they likely won't let me try iTeleport VNC in store though... :-( . This is great news to hear, a bit of a delay based on our rough estimated date but not bad at all. I have to buy online because no store in area so I was wondering weather the Saturday opening date will slow down delivery for me. Now comes my internal debate... which one to buy? $499 because it will fit the majority of my needs, and as this is the first iteration of the device, I will have to buy a 2nd gen iPad next year so I can get the built in webcam sure to be in that one. $829 the ultimate iPad, with no regrets I'd know I'd have all that it can be at this point at least, and if the iPhone OS 4.0 brings multitasking (more than one program open at once) I might need the best one out. Also, who knows what type of programs that might be coming out and how fast I'll fill up 64 gigs? Why will the iPad ultimately work? Because it can be whatever the programmers dream up and release software for it to be! End of april? Aww, crap... I wanted it for my birthday on the 4th. I'm only 40 miles from the border, fer crying out loud! How do you sync the IPad? Can you sync it with the same ITunes that yo sync your IPhone with or are they making a seperate IPad sync? I couldn't find how to post so I attached to this post. How do you post?